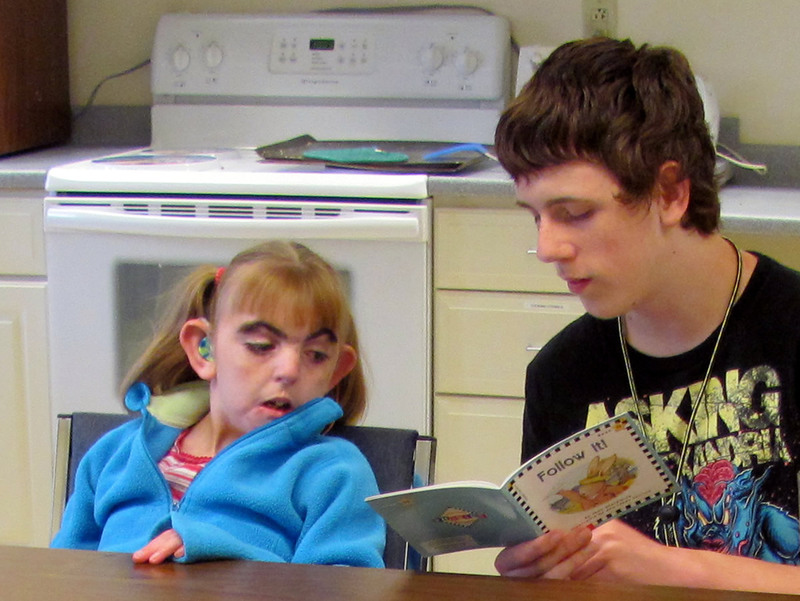 Interns in the Life Skills Programs at two New Hampshire high schools are enriching the lives of residents at the Cedarcrest Center for Children with Disabilities. For two summers now, the pediatric facility in Keene, NH has hosted a community-based vocational training program for five student interns from Monadnock Regional and Hinsdale high schools. The teens have various developmental disabilities. For part of each day, Cedarcrest Center staff members mentored the interns in job-shadow rotations – in housekeeping, lawn care, environmental services, facility maintenance, food services and administrative services. Then the interns honed basic academic and workplace skills with tutors from their respective schools. For the remainder of each day, the interns interacted directly with children at Cedarcrest Center, reading to them individually or engaging them in a game or activity. Karen Thompson, Vocational Coordinator for the participating schools, said the Cedarcrest Center “is a perfect match for the six-week program because our missions are aligned. “We help each individual – regardless of ability or disability – to develop and integrate academic preparation, socialization and functional life skills, ” she said. Sherri Vaillancourt, a Team Leader at Cedarcrest Center, coordinated the work experiences for each intern. She also facilitated the educational and recreational activities that provide a platform for interaction between interns and Cedarcrest students. “The program is a “win-win” situation for everyone, especially the children who live at Cedarcrest Center,” Sherri says. Teens at Cedarcrest Center enjoy interacting with other adolescents, and the younger children respond warmly to the special attention they receive from interns. Interns from the Life Skills Program benefit from acceptance as valued colleagues by Cedarcrest Center staff, and gain confidence as they practice important leadership skills. Cedarcrest Center for Children with Disabilities offers long and short term care for children with complex medical and developmental needs. For more information visit www.cedarcrest4kids.org or call (603) 358-3384.